In last week’s blog I talked about mindfulness. 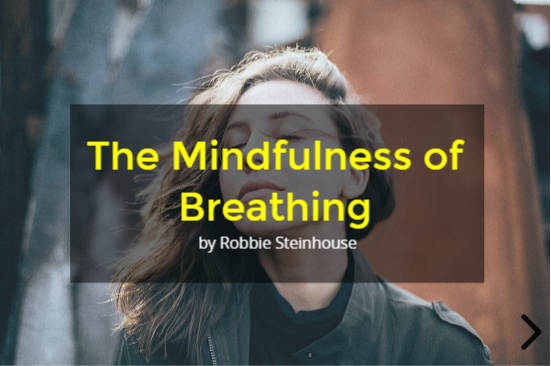 Find out how this simple technique for Mindfulness Breathing Can deliver more inner peace. Mindfulness Breathing can deliver more inner-peace. It is predicated on a slightly bizarre paradox: are we able to notice ourselves thinking, or is that just another kind of thinking? Are there ‘two of us’, a watcher and a watched, or is there ‘one of us’? My sense is that no one can ever know, and that being able to retain a sense that both are in some way true, is very helpful for mindful practice. Breathe in, breathe out, count ‘1’ repeat with ‘2’ and so forth until you reach ‘10’ then start again. You count each breath-cycle silently as you do so, saying the number at the end of the exhalation and thus marking the slight pause that comes at the end of the cycle. If you get lost, simply start again counting from ‘1’. This time, say the numbers slightly later, just before you start inhaling again. Again, count to 10 repeatedly. Here you are marking the beginning of the inhalation. Stop counting and notice the effect of your breathing on your body. Notice the movements it creates in your belly and lower back, in your rib cage, shoulder and neck. Try and notice the ‘pulse of your breath’ energizing your body – perhaps even notice it in your fingers or toes. Feel the change in temperature of your breath as it meets your nose and throat, and how it is warmer when you breathe out. Listen to the sound of your breath. Imagine breathing in different colours. Stop focusing on breathing or anything particular and allow yourself to simply ‘be’. I would start with ten to twenty minutes of seated practice, divided equally between each stage. As you progress, you will naturally extend the practice and stay a shorter period in the earlier steps. Find a place where you will not be disturbed and generally the counting is done in your mother tongue. A variation of this technique is to do it lying down, to help you go to sleep. During the process, you can begin to notice how thoughts and feelings (and how they interact) can distract you from focusing on your breathing. When this happens, allow yourself to detach from those thoughts and feelings (there will be two of you as you do this: the ‘thinker/feeler’ and the ‘watcher’ – allow the ‘watcher’ to gently move you back to being fully absorbed into the practice). This is mindfulness: the practice of noticing the arising of thoughts with an attitude of curiosity about the process of thinking, without getting lost or carried away by the content of specific thoughts. I have been doing this practice for over 20 years and it has brought me many benefits. I am sure it has made me more effective when communication with other people: I used to be more inwardly focused, aware only of my feelings and wanting to be liked, but not really that consciously aware of others – now I feel more present and engaged. Perhaps the greatest one is a sense that I can choose to enjoy the moments of my life without my thoughts interupting and taking over. It has also provided me an effective way of taking care of myself; a sense of being part of something bigger and, perhaps most importantly of all, spending more of my life experiencing genuine moments of inner peace and happiness.